Remember, over the last year, I have posted already on MQA - here and here. And summarized my feelings that it's essentially a smart, partially lossy encoder. My intent today is not to review the discussions previously or to rehash specialty hi-res audio files like those by 2L... The availability of a software decoder doesn't change those impressions nor general criticisms which we can still think about and summarize near the end of this post. However, it does give us a look at MQA in the context of real music that would be consumed by the average TIDAL subscriber. What I wanted to have a look at today is a few of the "Masters" albums available and a peek at what the MQA encoding/decoding did compared to what I believe are the hi-res downloads they originated as. As you can see above, one of these "Masters" albums is Buena Vista Social Club, released back in 2000 and has been available as a 24/96 DVD-A for years. 1. "Good Times Bad Times" - Led Zeppelin, from Led Zeppelin (1968). 2. 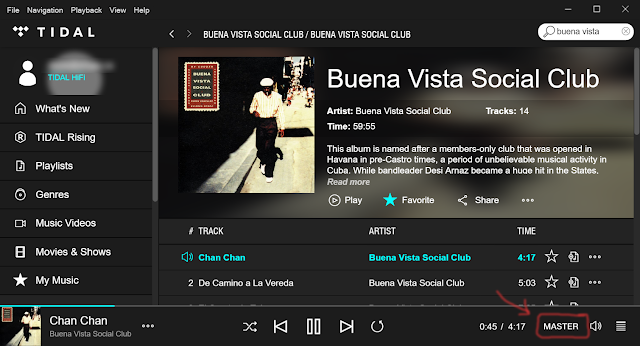 "Chan Chan" - Buena Vista Social Club (2000). 3. "A Case of You" - Joni Mitchell, from Blue (1971). 4. "Material World" - Madonna, from Like A Virgin (1984). As you can see, the peak and RMS amplitude values are almost all within 0.1dB for each of the tracks. This suggests that indeed the MQA stream likely originated from the same mastering as my 24/96 downloads or DVD-A rip. Notice the 29kHz noise likely from the analogue transfer is retained in the MQA. That's just an FFT capture of the signal 15 seconds into the song. Very close, eh? We basically see a steep frequency cut-off just past 20kHz. According to discussions here, Like A Virgin was a multi-track 16/44 recording mixed to 14/44; so resolution-wise, it's not even of CD quality to begin with. 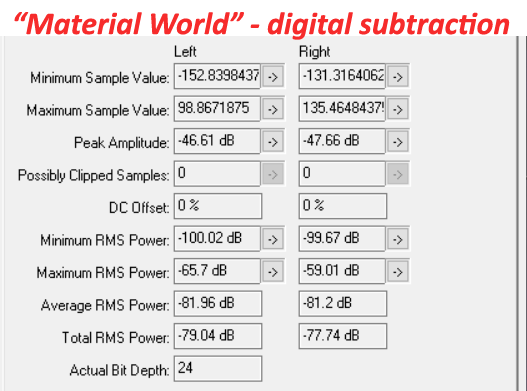 Spectral-Frequency difference plot - "Material World". Whatever the MQA algorithm is doing in the Madonna track, it obviously is very minimal in effect. This is good I suppose. It means the TIDAL/MQA Madonna sounds just like the HDtracks "studio master". You can see in the amplitude analysis that the "Maximum RMS Power" for the difference is down at around -60dB, and on average the difference is way down at -80dB or so. 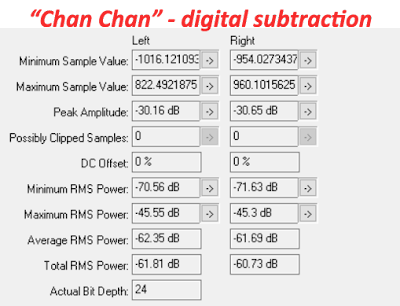 Spectral Frequency difference plot - "Chan Chan". 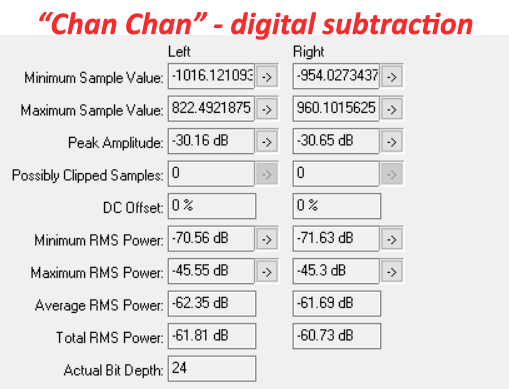 Difference FFT around 15 seconds into "Chan Chan". Although differences are there in the lower frequencies below 20kHz, it's in the ultrasonic range that we see a bit more signal difference... I assume some of this could be a reflection of the "lossy" encoding of the signal above the baseband or even some imaging products above Nyquist from the upsampler? 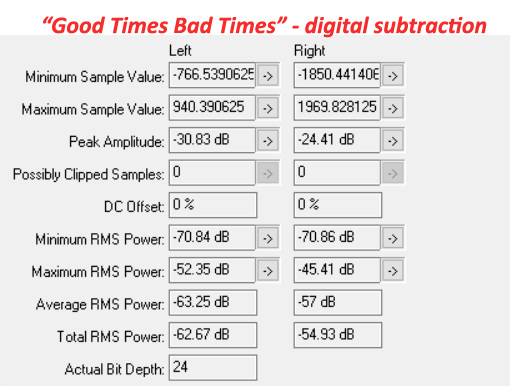 Spectral-Frequency difference plot - "Good Times Bad Times". The MQA file had an average RMS power difference of around -60dB compared to the 24/96 download. Again, if we look at the lower frequencies especially <5kHz, the difference is minimal. Joni Mitchell's "A Case of You" did not align well on Diffmaker although the DR values looked very similar. Null correlation was reported as only around 22dB but in A/B testing it actually didn't sound too different comparing the MQA decode with my 2013 HDtracks version. Visual inspection of the waveforms suggest there is a small DC offset. Also, there seems to be mild samplerate drift based on some messing around with Diffmaker. I can't be sure but it seems like they're the same mix, but different digital transfers perhaps. Not that big a deal since this looks like the noise we might see in a downsampled 16/48 file with noise shaped dithering from 24/96. However, remember that it's actually a 24/48 file being streamed so if we disable MQA-decoding, it'll be something like 16-bit quality while streaming in a 24-bit container. Moral of the story - keep software decoding on unless you have MQA-decoding in hardware in which case make sure that output is bitperfect and MQA is properly decoded (ie. the decoding indicator turns on). I noticed that the streaming software strips silence off the ends of the playback so I was not able to get a read on what an absolute silence noise floor looks like when encoded/decoded. 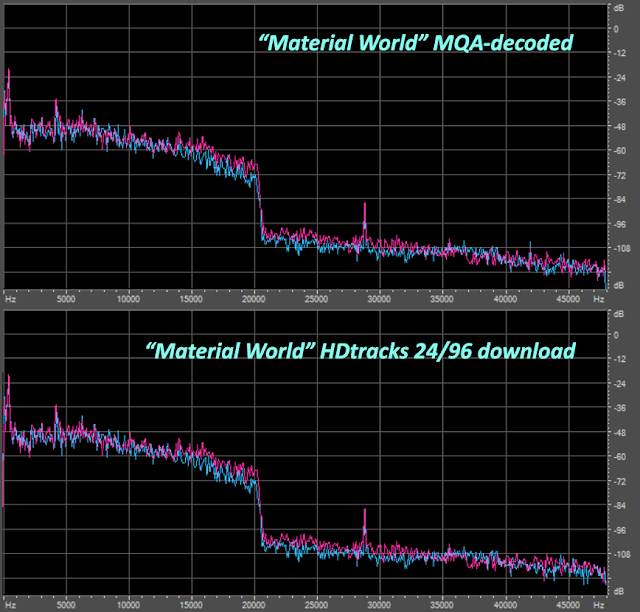 As you can see, the MQA 24/48 data is about the same size as the HDtracks file converted to 24/48. However, to stream that MQA data through the Internet, TIDAL needs almost twice the bandwidth compared to a typical 16/44 stream based on the highest FLAC compression. It is of course significantly less data compared to sending the original 24/96 files which by the way is less than 70% larger despite twice the samplerate. The bottom line is that MQA does take substantially more bandwidth to stream compared to the standard TIDAL "HiFi". If you are having any buffering issues with "HiFi" already like sending the audio through marginal quality WiFi, be careful with "Master" streaming. Also worth thinking about if you have data caps especially when the TIDAL app becomes available for mobile devices over cell phone plans (again, the effective data speed might be a problem if the wireless connection varies quite a bit). My experience here with 150Mbps cable downstream speed over the home ethernet has been good; 3-4 seconds of buffering before it starts to play. Otherwise no buffering issues or stuttering thereafter. 1. As shown by the Madonna and Bruno Mars tracks, there are obvious non-hi-res albums out there in the "Masters" collection (no surprise). It doesn't really make sense to be streaming MQA for those albums just as much as it makes no sense to pay good money for a 24-bit download of those files. There is materially nothing "high resolution" about them. As I said a few years back, true high-resolution demands both high quality material (hi-res recording, mixing, and master) and an ability to play the music back in an environment conducive to appreciation of the subtle difference over 16/44. Always be mindful of this. For me, truly high-resolution music is a rare cohort inhabited by only a few record labels who actually produce digital audio of that calibre (eg. AIX, 2L, Channel Classics, Reference Recordings, Chesky at times, a number of other classical labels). 2. MQA achieves its purpose with "smart" compromises. Internet streaming bandwidth is limited (looks like they're aiming for ~1.5Mbps). Files needed to be compatible with a standard DAC. Bit-perfect replica of the "master" was never their intent (remember the "crown jewels" comment in this interview). And finally it wants to be seen seriously as a high-resolution alternative which labels can sign on for - all the talk about "original resolution" and big numbers like 192kHz and such achieves this for the purpose of advertising and optics (while not being an exact replica of the actual "studio master"). Throw in the good reputation of Meridian as a company and Bob Stuart as a respected engineer. Add in the exaggerated voodoo around the benefits of minimum phase "apodizing" filter, plus whatever "deblurring" algorithm to impress the audiophiles under the banner of being "revolutionary" and "sounds better". Finally add an indicator (pretty green / blue LED!) to show that it's working and call it "authenticated" as another selling point. All the while, the basic idea is about sacrificing absolute bit-depth to reconstruct a facsimile of the ultrasonic spectrum for the upsampling algorithm. Folks, I can appreciate the compromises and I do believe MQA achieved what they set out to do in terms of the files sounding as good as 24/96 or 24/192+ "high resolution". Certainly there was intelligence put into this solution! However, achieving that sound quality in my opinion was never difficult nor did it require these contortions... Show me evidence that humans can successfully choose 24/192 vs. a 24/48 high quality downsample in a blind test using the same mastering. Would dithering and downsampling 24/192 to 18/96 with lossless compression not also sound good with decreased file size? This is why the technique brings to mind those overly complicated Rube Goldberg cartoons when a solution much simpler would have achieved the same sound quality, compression ratio, and compatibility. 3. If you're streaming TIDAL HiFi/Masters today without an MQA DAC, leave the software decoding of MQA turned ON. No point listening to a non-decoded MQA file with clearly inferior noise floor. To save yourself from hassles since output samplerate varies, it's best to just leave it set as "Exclusive" mode for the audio output, letting TIDAL tell the DAC what samplerate to use. Definitely make sure "Exclusive" is clicked with an MQA-capable DAC. I can imagine folks with MQA decoding hardware activating the "Passthrough MQA" box, forgetting to leave volume at 100% and not manually switching between 24/44 and 24/48 output without "Exclusive" mode thinking they're gaining benefits when it's actually not decoding properly! 4. Ultimately, subjectively, it's about how MQA "sounds". This is true of course with any lossy compression scheme - for example, it's not really just about the intellectual knowledge that MP3 is lossy that is the problem, it's whether the quality of the encoding/decoding compromised transparency for the listener. The same can be said of lossy video encoding - all DVDs and Blu-Rays and UHD Blu-Rays are lossy; but some look better than others. And in this regard, yes, TIDAL/MQA sounds great with the material I've sampled. 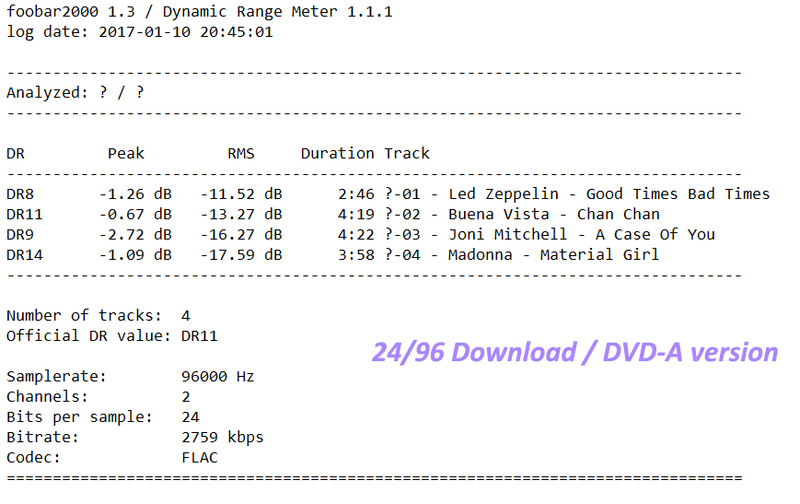 Objectively with the songs I examined, the software decoder works well to reconstruct what looks like the equivalent 24/96 download. As for the sound itself, having both the MQA decoded files and an original 24/96 "Studio Master", I have been able to do A/B comparisons easily with the foobar ABX plugin. For me (and my 45 year old ears! ), I was not able to score >70% when blinded using AKG 701 headphones with my ASUS Xonar Essence One DAC/amp for any of the 4 "mainstream music" samples I examined. This is corroborated by the "correlation null depth" measured with Audio Diffmaker where I'm seeing 70-85dB; much better than the typical 60-65dB null depths with MP3 320kbps using recent LAME encoder versions. The only exception to the high correlation null measurement was the Joni Mitchell track which sounds like it's the same mix, but I suspect it comes from a different transfer compared to the 2013 HDtracks version I have. Even with that one I was not able to ABX with impressive result. Sure, maybe if I sat down and meticulously listened for subtle differences, maybe did a bunch more A/B switching one very quiet night, nuances in certain passages may be evident... By the way, based on the findings, one would probably try to listen for slightly more high frequency "presence". I tried this with my wife in the main system downstairs for around 15 minutes before she got really bored. She was not able to consistently choose either. But seriously, that's no way to "enjoy" music. Whatever difference there may be with the MQA encoding process (ostensibly due to "deblurring" or whatever) is subtle and not worth obsessing over based on the MQA albums I've listened to so far using the TIDAL software decoder. Bottom line: TIDAL/MQA streaming does sound like the equivalent 24/96 downloads based on what I have heard and the test results (not that I think much of the mainstream music out there is true high-resolution of course). I'd certainly be cautious about claims that the 24/44 or 24/48 files sound "better" when non-decoded compared to standard 16/44 CD or that the "deblurring" makes a significant difference. The real question is still whether the album itself sounds good and truly high-resolution to start off with. To end off today's post, let's consider for a bit the whole idea of software decoding and think about how this all fits in with native MQA-enabled DACs. The big question of course is whether software decoding is good enough. 1. To make it compatible with standard PCM, the "high res" portion was squished into something like an 8-bit by 44/48kHz container under the noise floor which was then supposed to fill out the final 24/88-192kHz or whatever "original resolution" for playback. Regardless of the benefit of retaining >20kHz frequencies, it's not enough to reconstitute the original recording's resolution to account for every "bit" of detail. At best it's "perceptually lossless" and if there is "deblurring" DSP applied, hopefully it will be "euphonic" and will not result in objectionable sound quality. 2. As a firmware upgrade, the algorithm cannot be too complicated! How much power do we think a Meridian Explorer 2's embedded CPU has? Or the announced MQA firmware upgrade for the Dragonfly**? Sure, they might tweak a little here and a little there, but this is nowhere on the level of DSP processing like using HQPlayer on a desktop PC/Mac/Linux for transcoded DSD128+ playback! At best, these little processors hopefully can do a decent job upsampling 48kHz input to 192kHz with a reasonable anti-imaging filter and fill in a facsimile of the ultrasonic content. Remember that firmware capabilities are limited by the underlying hardware. Therefore, a device like the Bluesound Node 2, although said to have a 1GHz "multi-core ARM Cortex A9" processor (I'm guessing dual-core A9 like many of the WiFi routers out there), is a slower machine than a Raspberry Pi 3 which is a quad core 1.2GHz Cortex-A53 with newer 20nm processor architecture. I don't think it'll take a creative coder too much effort to figure out what the algorithm is doing and writing their own decoding/upsampling routine now that the software is out there. In fact, a high quality decoder done on a much more powerful computer with better upsampling algorithm and arithmetic precision would be more accurate than the wimpy processing on essentially any DAC. Decode everything to a good 24/384 DAC or even transcode to DSD128/256/512 if you want and experience the best the MQA CODEC is capable of; maybe even stream at this high-resolution to a device like a Pi around the house. Furthermore, software decoding includes the opportunity to manipulate the sound with DSP in playback which IMO is way more useful than what MQA claims to do in the time domain by taking into account your speakers and your room - not just your DAC. This is the logical future for MQA decoding if we truly want the best possible sound quality utilizing the power and flexibility of computer audio! Understandably, Meridian/MQA will not like this idea and will fight against this unless decoders are all licensed appropriately of course. 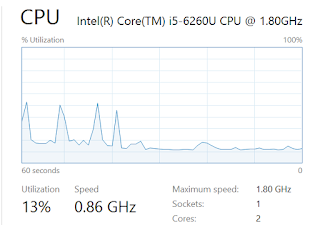 Watching the TIDAL player software (2.1.1.160) in Windows 10 on my Intel NUC 6i5SYH with a bunch of background tasks running but not active like a browser, Skype and Twitter app, streaming MQA "Master" over WiFi only used about 13% total activity with the i5 CPU throttled down at 0.86GHz. i5 NUC playing a software-decoded MQA stream at 24/96 to USB DAC. Probably some buffering at the start (left) followed by steady low CPU utilization. 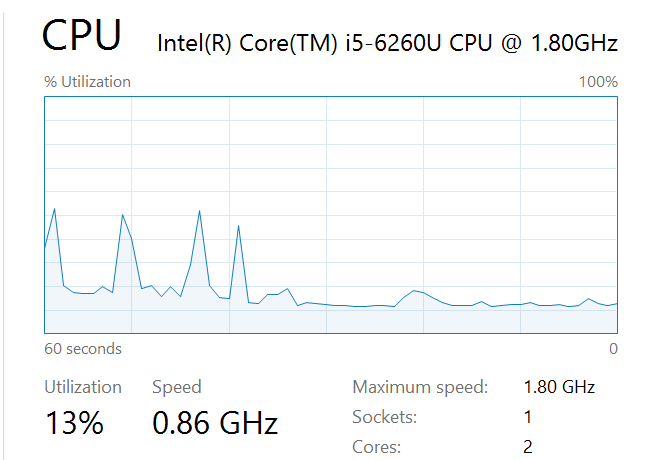 Obviously, there are plenty of CPU cycles available if anyone wanted to use the resources of the i5 NUC, itself not a particularly powerful computer these days. With that, I think I've said enough about MQA for awhile. My curiosity is satisfied and it's time to just listen and enjoy... I see there's now talk about MQA "Core", "Renderer", "Decoder" designations to stratify the different levels of processing. Folks at MQA, I think you should keep it simple. Speaking for myself rather than as a generalization I expect anyone else to accept, after all these years of listening, measuring, and thinking about it, I could care less whether the lossy "unfolding" goes out to 192kHz or 384kHz; all smoke and mirrors as far as I am concerned since it's inaudible plus lacking in decent recordings. 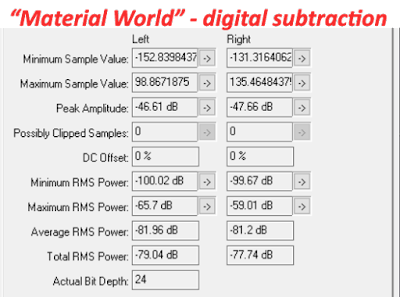 Furthermore, even inexpensive high-resolution DACs are remarkably accurate these days so whatever tweaking is being done for individual DACs is highly dubious and more than likely perceptually meaningless. Nonsense complexity like this especially if gushingly embraced by the audiophile press will only serve to confuse the public and remind the typical music lover what they've suspected for a long time; "extreme audiophiles" are emotionally insecure obsessive-compulsives cognitively weak in performing reality testing and prone to the use of superlatives in advertising and media. Dear readers, IMO don't be an "extreme audiophile" and end up like that :-). Remember that TIDAL does have a free trial if you want to have a listen to these software-decoded MQA albums and decide for yourself. Hope you're all enjoying the music... It's going to be busy for me over the next couple of weeks, will check in when I can. ** Addendum on the AudioQuest Dragonfly: I see some folks are getting excited about this firmware upgrade for the Dragonfly Black and Red. Recent news seems to suggest that the update would allow these DACs to function as MQA "Renderers" which is a lower level of processing than as a "Decoder". Supposedly this means you still need the software upsampling to 88/96kHz then the DAC will perform some final corrections internally on playback. Obviously these Dragonflys are not able to accept samplerates higher than 96kHz anyway. As you can see from this PDF of model comparisons, the newer Black and Red are using the Microchip PIC32MX embedded microcontroller. The CPU on this low cost device can only run up to 120MHz and typically have a small amount of RAM, only 32KB up to 128KB. Based on the product page, the speed even of the fastest 120MHz product is rated at only 150 Dhrystone MIPS of integer performance! Guys, that's about the speed of a first generation Pentium 120MHz from 1995 unless there's something else inside the Dragonfly. Hmmmmmmmmmmmmm... (Notice the extra long period of contemplation.) If it is true that there is an upgrade coming for the Dragonfly, what are we anticipating this firmware to do for a signal coming in at stereo 24/96? What kind of DSP can be performed with so little computational potential? Doesn't seem to be near enough power to even upsample 96kHz to 192kHz decently much less actually provide any sophisticated signal processing to do time domain corrections! Well, let's see what kind of magic AudioQuest can pull out of this kind of hardware. I certainly would not put a bet on anything sophisticated going on unless I've neglected something major. I suspect all it might be doing is detecting the presence of an MQA decode and just sending some different settings to the ESS DAC (like changing filter parameters?). If so, this would be reminiscent of HDCD which incidentally was also released to consumers in 1995 :-). I really appreciate your blog and methodical testing approach to audiophile claims. It's refreshing to read a voice of reason when it comes to hi-fi. I was looking for the Buena Vista Social Club album you mentioned on Tidal, but I can't find the master audio version anywhere. The only albums that show up for me are the non-master. Is there something I'm missing? Thanks for the note Jonathan! I just logged on to Tidal now and clicked the album which I had saved to "My Music". You're right! They pulled the MQA for some reason... Says "The content is no longer available." when I try to play! Strange... I guess albums can be added and pulled off at any time? Hopefully just a temporary thing if they're just refreshing it or something. The 16/44 "HiFi" version is still there. Speaks to one of the benefits of ownership of one's music rather than a "rental" model where options could come and go. Very thorough and meticulous examination. For me, on my system the Madonna album sounds much better with Tidal app decoding than undecoded. Since it costs me no extra I am a happy camper. The differences are not in the "sound" per say, but the soundstage imaging, which is much clearer and focused - Madonna's rather thin voice has never sounded better to me. No cost nor harm to just stream the decoded 24/96. Of course whether there are soundstage differences and whether it's due to MQA or perhaps your DAC performing better with 96kHz signals, ultimately that's a subjective call for each of us. Since it's unclear how TIDAL "reaches" the USB and then the DAC ("Direct Sound", "Kernel Streaming", WASAPI, ...) I followed a different path. I streamed the output from TIDAL through "VB-Audio ASIO Bridge / Hi-Fi Cable", then ASIO4All. Worthless ? not "bit perfect" ? Not worthless at all... I assume the above should be bit-perfect although it would be tough to confirm unless we did a digital capture of the output sent to the DAC. Or perhaps you sent the stream to a HDCD decoder or DTS decoder and prove to yourself that it's perfectly decoded. Remember that we're just transporting a 24/96 stream which is a "lossy" decode of the MQA file. Strict bit-perfection like say for HDCD, DTS, AC3, even MQA to a native DAC/decoder would be important. But even if say there's a small amount of dithering added to the LSB when sending the decoded 24/96 to your DAC, this would not be audible. Thanks, but ... I'm a little confused. What's happening in the chain? Is TIDAL streaming an MQA file ALL THE TIMES ? even for the music that is available ONLY in CD format ? Hmmm, assuming the setup is going right, Tidal should be sending out 24/88 or 24/96 for these MQA-decoded audio. I would imagine that Hifi-Cable and ASIO Bridge should be reporting this coming out of Tidal and relaying this to ASIO4ALL; and the AudioLab should therefore be playing the high-res signal. I have double checked on my system and indeed, even without "Exclusive" checked off, if I tell Windows that audio output to the DAC is 24/96 format, Tidal will send the decompressed high-resolution signal. Is that what you're doing with the Windows mixer, that HiFi Cable output is 24/96? I was in the same situation of Oláh Ottó. It's not evident how to find the "MASTER" records. I'm playing now "The Division Bell". Tidal writes 24/96 for it. The VB-Audio console however says 24/48, as my Audiolab. Now if I disable the MQA decoding the sound stage becomes more compressed. On the contrary "The Endless River (Deluxe)" is really 24/96, from start to end. When I compare the same album, played with JRiver/WASAPI, I cannot hear any difference. Anyway: the Tidal user interface is simply ugly ! The only target people that could appreciate its quality are the "melomanes" and the audiophiles. It can compete with Qobuz, but not with Spotify (given that the target audience is deaf). "My Music" becomes rapidly useless once you "own" 100's of albums. An user interface like the one of JRiver would be greatly appreciated. 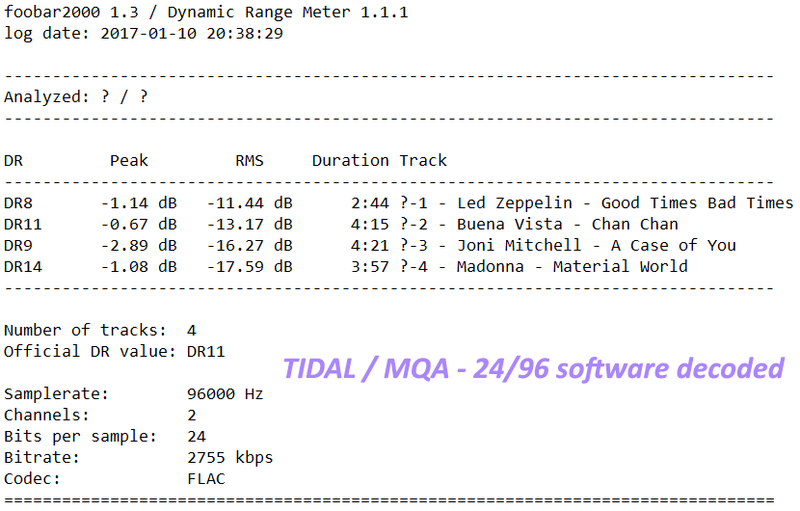 if you would turn off MQA-decoding in Tidal desktop app, and capture the Tidal MQA stream bit-perfectly via Soundflower -> Audiohijack -> file on Mac/OSX or VB-Audio ASIO Bridge / Hi-Fi Cable on Windows (all set to 24-bit / 48kHz), would the resulting file be the original MQA-file ? in other words, if you would send that capture file to an MQA-enabled DAC (such as Meridian Explorer2), would the blue light turn on, i.e. would the MQA captured file unfold into 24-bit 88.2 / 96 / 176.4 / 192 kHz and possibly higher ? Yes. I tested a portion of the 24/48 "Chan Chan" capture to a friend who reported that the indicator lit up :-). PS - seems the end of hi-res audio file sales - 1 month of Tidal subscription is cheaper than 1 hi-res album purchase in DSD or PCM - i wonder if that means that Tidal is going to differentiate its service offering further, from current 320kbps ($ 10 /month) and hi-fi ($ 20 / month), to additional master subscription for $30 / month ? also, what is Qobuz going to do ? they are only providing hi-res download purchases, although at a discount, they still have to be bought for additional money on top of the money you already pay for the streaming subscription, and are not available in streaming format / Qobuz currently only streams at 16-bit / 44.1kHz. Yup, I agree. For the music lovers this is a real boon in having access to all the music one needs! Plus videos and exclusives. Hi-res downloads with their low-value pricing structure will have difficulty competing. Only those who really "need" a certain album in their collection and for it to be high-res would be interested I suspect. Everyone else; a CD/vinyl for physical ownership, and streaming subscription whether it be Tidal, Apple, Spotify probably will do the trick. Let's not forget the cheapest alternative - YouTube! I have recorded the un-decoded MQA bit stream from the Tidal desktop app with ASIO Bridge and Audacity as Mr Hendriks suggests. However when played back thru a Mac Mini with the Explorer2 DAC the MQA (blue) light on the DAC did not light up. Could one of you contact me to provide the exact set up used to successfully record as was described in the 15 Jan 2017 commentary? If you make a small sample (a few seconds is enough) available, I can check if it is valid MQA. Thank you for the quick reply and your offer to help. I can provide a small sample of the FLAC file that was recorded from the Tidal app but I'm not sure if I can attach it to a reply in this forum. Can you provide an email address where I can send it instead? Archimago: In your comment of 15 Jan 2017 at 16:14 you reported that a friend had successfully replayed a recorded MQA-encoded sample that you provided. Can you please tell me what software/program was used by your friend to play back the MQA-encoded sample of "Chan Chan" that you provided that successfully illuminated the MQA signal light their DAC? Thank you. Nice analysis Archimago! have you compared your 24/96 downloads with Tidal MQA through an MQA DAC? (sorry if I missed it!). I find the hardware decode with a Mytek Brooklyn to be significantly better than the TIDAL software decode, which I struggle to distinguish from the non-decoded 24/48 version. The MQA decoded version is just more relaxing and involving to listen to, a real pleasure. Hi Rich, no I have not tested the hardware decode and differences compared to pure software. I do not have a native MQA DAC but have already started discussion with a friend about doing the test through a Brooklyn. Will work on this over the next few weeks and of course publish when I have some data and conclusions to add :-). Appreciate the input and will put in an addendum to the text. Great work BTW; looking forward to the dissection :-). *** Guys, added a bit on the Dragonfly DAC and it acting as an MQA "renderer". I don't see much potential that it could really do anything of value to the sound! Anyone have more info on what's inside the Dragonfly that could actually process 24/96 stereo audio!? Apparently the Dragonfly Black/Red have the PIC32MX270 chip which tops out at 50 MHz. Running the software renderer from the Bluesound firmware on a Cortex-A7 CPU requires about 96M cycles per second of music. In other words, the CPU would need to run at 96 MHz or faster to keep up if it was doing nothing else. Now this is a completely different CPU architecture, so clock frequencies can't be compared directly. That said, The MIPS M4K core of the PIC32MX handles multiplication less efficiently than the ARM, and the algorithm does a lot of multiplications (at the core it looks like a standard convolution filter approach). On the other hand, the ARM code isn't particularly well optimised. All told, however, it doesn't seem likely that this code is running on the Dragonfly. More probable is that they simply program the ESS DAC with custom filter coefficients and let it do the upsampling. Sounds like you must have had a peek under the hood to be so specific about the chip! That's ~80 DMIPS only at 50MHz. That's like a Pentium 60MHz from 1993 then :-). If the "Renderer" devices are able to detect an unfolded MQA file at 88/96kHz, then I guess there must be some signature in the lowest bits to indicate this. I don't have a Dragonfly, but I found a mention of the chip somewhere and looked up the spec sheet for it. There is indeed a signature in the LSB of "unfolded" MQA. I just posted the details of it in the (new) thread on CA. Interesting Mans... Looking forward to your further test results on that Node 2 firmware. BTW, for those wondering and for perspective. The Raspberry Pi 3 at stock 1.2GHz achieves about 2400 DMIPs. The ODROID-C2 achieves about 3600. Gives you some relative idea of what's inside the Dragonfly. I've done some more analysis of the renderer. 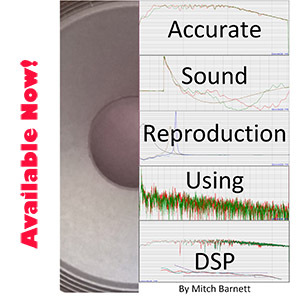 All it does is resample using filter coefficients specified by metadata carried in the LSBs of the audio signal. The Dragonfly microcontroller need only extract the metadata and program the correct filter into the ESS DAC. The processing power required for this is negligible. I can't believe how Tidal is not able to explain their users how to use this great exclusive feature. Fortunately your article explained it to me. I use a Chord Mojo, I turned on "exclusive mode" and "force volume" under the Tidal app's Settings / Streaming / Sound Output / Mojo / [hidden settings options when hovering over "Mojo"]. With this configuration, the Tidal app is able to switch the output bitrate. I have seen 44.1, 88.2, 96 KHz so far. - They don't call it MQA but MASTER. Tidal, this should be your differentiator! Execute it properly! I use iTunes, it's just much more convenient than TIDAL. People will not switch to TIDAL for a nominal sound quality improvement if the playback experience is worse. iTunes was not the best sound quality service when it started, but the most convenient. At the end of the day I'm happy that I can hear some SQ improvement, I'm did confidently in a blind test. Previously, I decided it was not worth the price and storage hassle for me to buy HD material, but streaming does! I hope offline mode is in the works and the phone apps will get MASTER soon. I think you've brought up an important point about differentiating the versions on Tidal. Very strange that they didn't change the album titles to something like "Like A Virgin (MASTER)" to at least allow searches and selection. Doing this would be similar to how they already have Lady Gaga's "Joanne (Deluxe)" to differentiate from the regular version. Considering all the work with executing MQA, one would have hoped they put in more thought to the very important aspects of the user experience! then Albums to the right. Then the Masters Tab comes up. How intuitive is that? at least on a Mac that is how it works. I found this out through a 3rd party review. They say there are 30,000 tracks and counting, but many I have sampled are@#%&*. You can't put lipstick on a recording pig and expect it sound any better. No control as Phase Inversion (as may CD content sound best if phase inverted), Equalizer & Gain Control. Well, streaming is a "rental" after all... And ownership certainly has its privileges when it comes to fine tuning how, when, where, and modification of the sound. However, the ability to access so much material is great. It's worth considering "what kind of music lover" one is. I do enjoy the act of collecting in that I have multiple masterings of some albums for example as highlighted on my Jan 1/17 post on tagging. I even don't mind the tagging process and the discipline in maintaining the collection. But obviously that's not for everyone and I would not be surprised if most people want to just spend time listening and not worry about the obsession-compulsion of the collector :-). Wow that's fantastic ! I asked Tidal if more MQA titles we're available but not listed in the Master's section and the reply was no So well done ! Don't know how you did it but will it get updated ? I have followed your blog for a while now, and have been particularly interested in your comments on MQA. My overwhelming impression is that MQA is offering audiophiles something they don't really need, and that if the mastering step of the chain was overhauled (getting rid of the loudness wars) then we would have extremely good audio anyway. I feel that the full potential of even 16 bit CD was never fully realised due to poor mastering etc. Me, on my side, I can witness that MQA doesn't do miracles, but it works. With some good recordings one hears (with MQA) clearly a widening of the stage, more focusing of the instruments, more "air" (as we usually say). Hey guys, I just responded and wrote a long note which I'll post as my "quickie" post of the week :-). I think that's where I fall on this too. To me streaming (or renting) is akin to FM radio. You go there to listen to new sounds and to develop new tastes, but when it's time to sit down with a glass of whatever and enjoy your own collection my own files come out. I have Spotify Premium for music discovery and I just don't see the hook on paying twice as much for MQA. Sorry about that, but I completely disagree with you. The model you describe is (as far I have understood from my daughter) the one of Spotify. The model of Tidal could be completely different. More similar to the one of Qobuz. Let me start from the beginning: I bought the vinyl of “Sgt. Pepper's Lonely Hearts Club Band” in June 1967 (I was 16). Beautiful sleeve, with pictures and lyrics. Then I bought it (again) in CD. Then (again and again) in 24 bits (remastered). The sleeve ? first smaller, then gone ! Should I fight against this trend ? “Resistance is futile” (as a Borg said). At the end of the story what we want is music well recorded, well mastered, & all that. I really don’t care of where it is. After the crash of a hard disk, what is your main question ? I guess: “When I did my last backup ?”. Me, I’m transferring all my (precious for me) work “on the cloud”. I purchased one year of 1 TB on OneDrive (or whatever you want) and my life is better. Same for music. My beloved music is on some Tidal server, who cares if it is in Seattle or in Norway ? The important thing for me is read “Diapason” and then discover that “Rachmaninov & Prokofiev: Works for Cello & Piano”, Johannes Moser - Andrei Korobeinikov, has been awarded of a “Diapason d’Or”. I go to Tidal (or Qobuz): it’s there ! I listen to it, I like it, and I save it into “My Music”. I buy it, in some sense. Then there is the problem that the metadata handling of Tidal is rudimentary (I would like for “my Music” an user interface similar to the one of JRiver), but this is another story. Thanks Teodoro and I appreciate your opinion. You say that we all want music that is well recorded, well mastered and well packaged; on those things we agree completely. Tidal indeed could be more in the future although right now it's not there in my opinion. But I do not support the candles over LED lighting and if there is a better solution in the future I will gladly adopt it! Dear Archimago, finally, it's time for me to say something about your blog: I love it! You cover many, many things I wanted to do for a long time. But I won't need to do them since your articles are in-depth and very detailed. Furthermore, I wouldn't remotely be able to do them as good as you. I very much love that you haven't given up doing measurements, especially when the audiophile community abhors them. After all, electronic devices behave in a pre-determined way - so they are measurable. I also love that you strive to adhere to the objectivist principle. It took me a few years (talk decades) to finally arrive at it and I feel that I've (let myself) been fooled by the industry for a long, long time. If only something like your blog would have existed 20 years ago. So, thank you. And keep up the good work, I always enjoy reading your articles! Sounds like we've traveled the same trajectory in life :-). Every once awhile over the years I'd see posts about blind test results, or people who try things like coat hangers for cables! But never did I see anyone especially in the official press try to gradually and comprehensively evaluate the set of beliefs found in the audiophile hobby. If objective measurements are done, they'd somehow be demoted rather than used to seriously question the judgement and insight of purely subjective opinions especially in situations where the results clash with reasonable expectations of ideal performance. I suspect many of us over the years as we go through our education and experience in the world have developed a skepticism with much of what we read... My hope is that objective measurements, and trying to be reasonable and consistent in my expression of opinions and beliefs consistent with what I hear, how I think, and ultimately how things measure can reflect the reality of our hobby. Yes, reviews done by the official press read more and more like thinly veiled advertising attempts. In some cases it's so obvious that even unsuspecting customers should be aware that either the magazine (online or print) was paid for that review or was just friendly in order not to endanger advertising revenue. I especially hate their attempts to make their readers believe in the myth that extremely expensive equals extremely good. Sometimes, I ask myself if those reviewers (or the manufacturers for that matter) actually believe their claims or if they knowingly try to fool customers. So it's good that you are here. I myself however have given up... sort of. I cannot say anything anymore other people haven't already said in a superior way, furthermore, my hope that I can educate people has somehow disappeared over the years. Considering the constant attempts of a greedy industry to sell stupid stuff that people don't need. And, of course, because of the blissful ignorance of these very people. Again, it's good that you're here. Measurements and objectivity are the perfect tools to rate something that is essentially applied physics and mathematics. So thank you for breathing objective life into this subject! I'm just "evaluating Roon over TIDAL. But I cannot pay each year to Roon the same amount of money I shall pay to TIDAL for features that should already be in TIDAL ! Roon is a little "steep" isn't it! 5. My network is not superfast: "only" 10Mbps, so I had accepted some dropouts from TIDAL. With Roon there are no dropouts, never ! and the data/music provider is always the same: TIDAL ! and ONLY if WASAPI Exclusive mode used, otherwise the MS DSP SW mixer & SR converter may used. Having evaluated (negatively) the work done by the TIDAL developers, I tried to understand how Qobuz behaves. Yes, it's for Europe only (not even for Italy), but it was easy to convince the program that I'm in France (or UK, if you like). Me, I have used Hola!VPN on Chrome. Good, very good ! Archimago you should have a try ! It's only 16/44.1. But who cares ? Audirvana for Mac is about to release their Plus 3 version with embedded MQA decoder. As a longtime user I'm looking forward to that. One hopes it will be better than Tidal's software decoding. This new version is set for release "end of January" - so, fingers crossed. The MQA decoding module is no doubt exactly the same as in Tidal. The user interface is probably better, of course. Audirvana 3 is now scheduled to release in mid-february - regarding a tweet from @audirvana from today! Let me add one more comment (please don't feel bothered): TIDAL and Qobuz developers are null ! So I decided to give a try to JRiver 22 (I already own version 18), used as WDM driver. All that without the tax imposed by Roon ! TIDAL price is 19.99/month. Same for Qobuz, but there is a discounted price for one year: 199.99€. Interesting observation Teodoro regarding using JRiver 22 as playback device. I've used it for other things. Glad to hear this solves some of the problems! I forgot to say that you have to run Fidelizer first, otherwise you get some nasty BSOD (otherwise there are conflicts with JRiverWDMDriver.sys). This way even Spotify is unbelievably good. So, bye bye to TIDAL and Qobuz (full of debts and hardly surviving).